David Cameron must be beginning to wonder whether the bedroom tax will prove to be as damaging to his government as the poll tax was to his beloved Margaret Thatcher's. With Labour promising to scrap the tax, which cuts benefits to claimants deemed to have a spare bedroom, the measures are also beginning to be challenged in the courts. The latest setback for the coalition government came when the Conservative-run Westminster council lost an appeal case brought by a blind tenant who used a spare room to store vital equipment. Surinder Lall argued that the room in question had never been a bedroom. The judge in the case highlighted the rather sloppy definitions in the bill. "The term 'bedroom' is nowhere defined," the ruling stated. "I apply the ordinary English meaning. The room in question cannot be so defined." 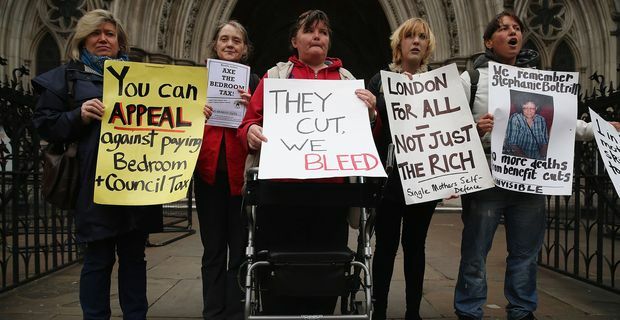 Of the 80,000 London households affected by the bedroom tax, more than 50,000 involve disabled people. Westminster council might consider themselves unlucky to have come up against Lall, who is a qualified barrister. The ruling suggests that the government and local councils forced to implement the measure, may face a series of humiliating defeats in the courts, which will also expose the way that the tax victimises the vulnerable and needy. The government has already faced the embarrassment of being criticised by the United Nations for the measures. UN representative Raquel Rolnik had been highly critical of the bedroom tax, provoking Conservative Party chairman Grant Shapps to complain of political bias. Shapps wrote to the secretary-general to express the party's disgruntlement, a letter that may not have featured too highly on Ban-Ki-Moon's list of priorities. A UN spokeswoman insisted that Rolnik had acted perfectly acceptably. "She is not a staff member of the UN, is neither accountable to nor appointed by the secretary general," they said. The bedroom tax already looks like it has shifted the Conservative image back into the realms of the "nasty party".